The Government will continue to ensure the safety and security of visitors while out at sea. Minister for Industry, Trade, and Tourism Faiyaz Siddiq Koya told those at the Fiji Tourism Expo yesterday that maritime safety is a priority. Mr Koya made special mention of SeaFiji’s pro-active stand in ensuring safety and investing in the tourism sector. He said that regular training and awareness campaigns on safety standards and licensing requirements are conducted in coastal communities. SeaFiji launched two new products as well as its safety video at the Fijian Tourism Expo 2015 in Denarau. 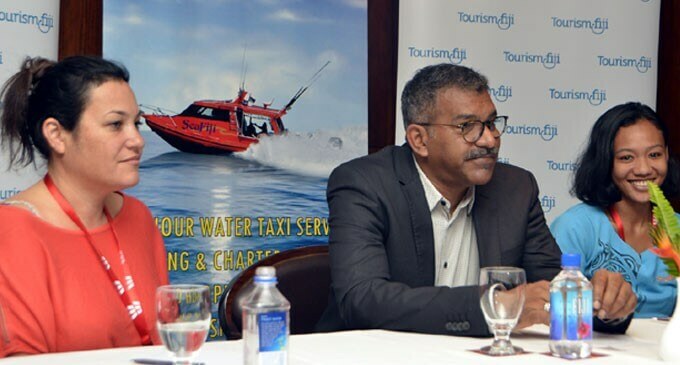 Global director Ron Bradley said SeaFiji Airlink in conjunction with Pacific Island Air would offer air connections from Nadi airport while SeaFiji Link offers a direct boat service from Port Denarau to Resorts in the Mamanuca islands. The cater for all in-bound flight arrivals into Nadi before 4pm daily. Ms Bradley said: “We decided to use the Fijian Tourism Expo 2015 as a platform to launch our two new products, SeaFiji Airlink, SeaFiji Link and our Safety Video because the event brings buyers from around the world as well as suppliers who are using our services already together in one venue. She said they can fly or boat transfer to island locations such as Castaway, Likuliku, Matamanoa, Tokoriki and others for $385 by air or $159 by sea. Safety remains the top priority for the SeaFiji team. Other products include full and half day cruises, resort transfers, inter-island transfers within the Mamanuca. Plus a variety of water sports including snorkelling, game and sport fishing, semi submersible submarine which are all available at Mana Island Resort.